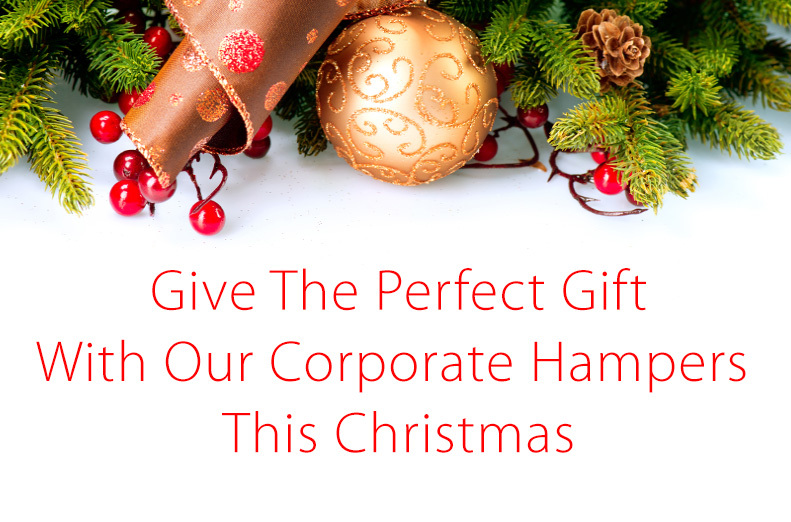 If you’re looking for the perfect corporate gift, we at Hampergifts have a fantastic selection of corporate hampers and gifts that are sure to be a crowd pleaser. Perhaps you want to thank an employee for all their hard work throughout the year, or maybe you’re endeavoring to get your brand out there. 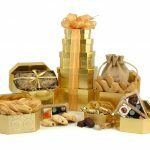 With our selection of beautifully presented hampers full of melt-in-your-mouth decadence, you will find the perfect gift for any corporate occasion. 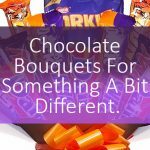 If you’re placing a larger corporate order then we can offer generous discounts and reduced delivery charges for bulk drops. 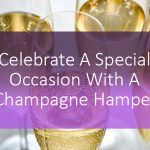 A fantastic choice for when you want to thank a hardworking employee for all of their efforts throughout the year, this stunning Christmas hamper contains an irresistible pairing of delightful decadence with a deep red Shiraz. 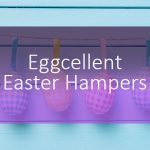 We think they’ll adore the mouth-watering yoghurt coated nuts, sumptuous Belgian chocolates and the delightfully moreish olive biscuits. Coupled with a glass of the award winning wine, and you can be sure your colleague will know how much they’re valued. 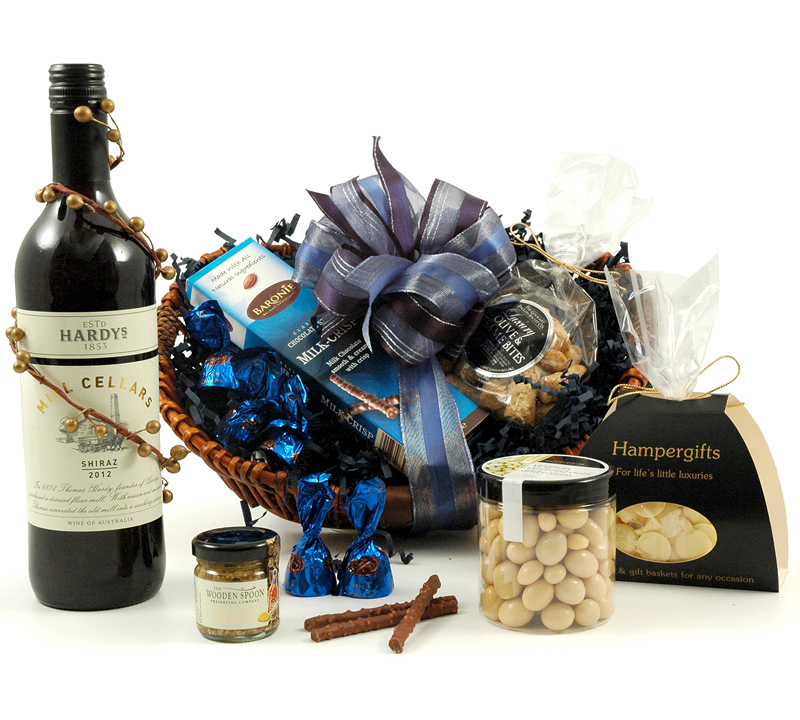 To see more hampers like this, click here. It’s nearly that time of year again and before you know it, the yearly office party will be upon us! Are you stuck for gift ideas that will be kind to your wallet? Maybe you’re buying for more than one person. 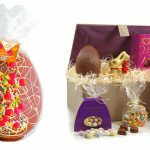 The Snowy Delights hamper is bound to be a crowd pleaser. 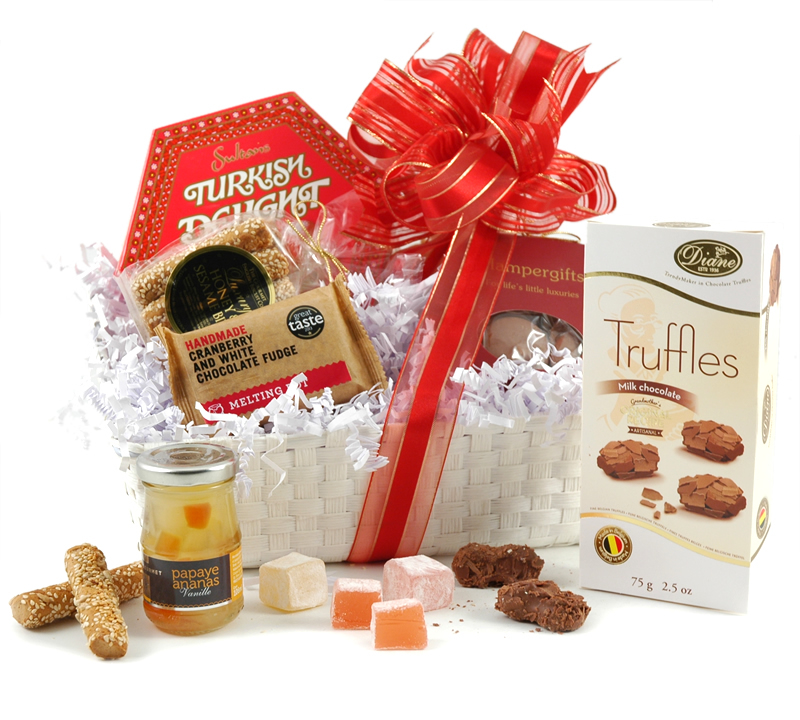 With its sumptuous selection of exotic rose and lemon Turkish delight, and award winning fudge teamed with Belgian chocolate truffles, this festive hamper exudes luxury without breaking the bank! We all know a picky eater, and when it comes to giving them a gift, it can be rather tricky to find the right one! 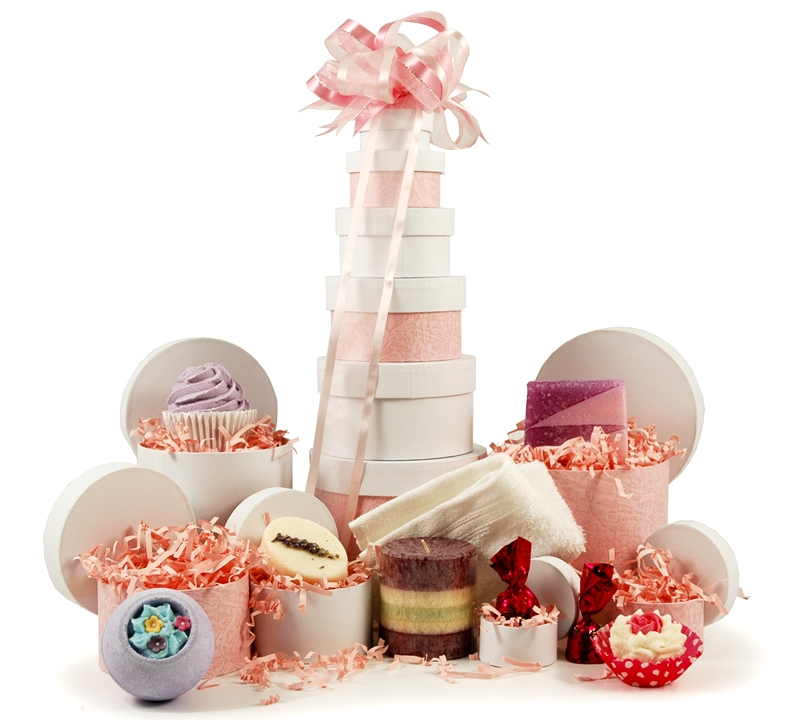 Our Bathtime Gift Tower is jam packed with a stunning selection of deliciously scented bath products for the perfect relaxation session, all topped up with a par of cherry truffles in the top box. From a deliciously aromatic Black cherry scented candle, to dreamy bath brulee and sumptuous skin butters, this gift tower is the perfect present for anybody who loves to be pampered. Perhaps you’re working to create more brand awareness for your company, and you want to give a memorable gift. 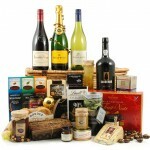 We have a fantastic selection of crowd pleasing hampers and gifts to choose from. 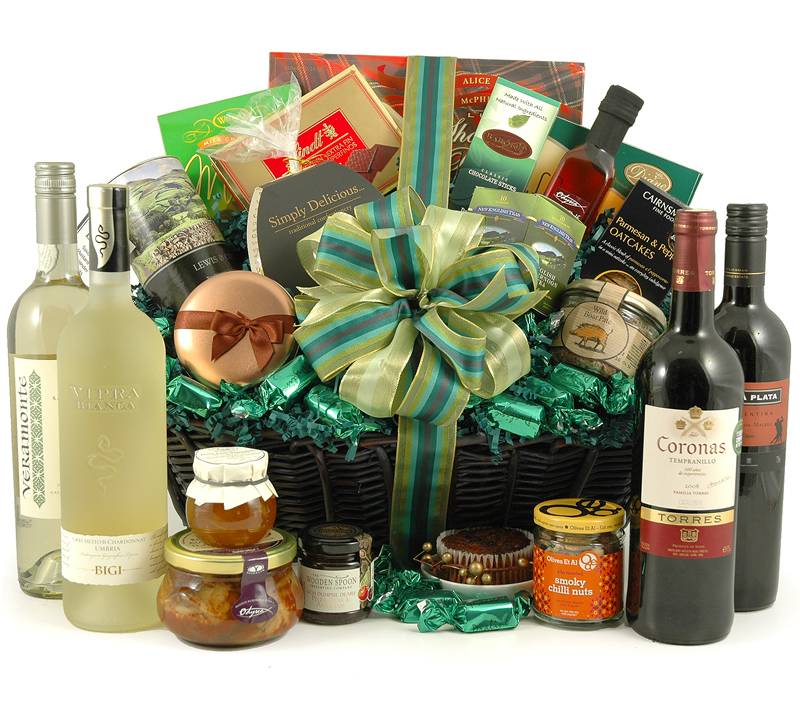 The always popular Grande hamper is bound to turn heads. 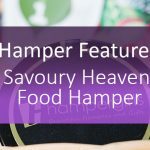 This enormous gift basket is packed with a fantastic selection of award winning wines and a dazzling assortment of sweet and savoury treats. With delectable delights like Venison Pate, Belgian truffles, English cider chutney, cajun spiced nuts and a wide range of other mouth-watering luxuries, The Christmas Grande is the perfect choice for clients and colleagues. 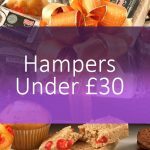 Many of our customers use our hampers as part of their brand building strategy. Here are a few ways we can help! Your logo, laser printed onto the gift card, alongside your message. Business cards, flyers, Christmas cards or more sent with your gifts. Ribbons and packaging to match your corporate colours.